In 12″ skillet over high heat, heat 1″ water to boiling. Add carrots: heat to boiling. Reduce heat to low, cover and simmer 8 to 10 minutes, until carrots are crisp- tender. Drain. Return carrots to skillet; add butter and salt. 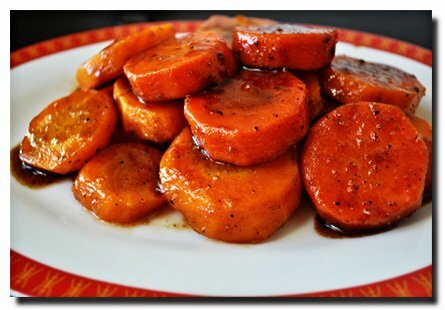 Over med-high heat, cook, stirring carrots occasionally until they are glazed and golden, about 10 – 15 minutes. Pour maple syrup over carrot mixture; heat to boiling. Boil 2 minutes, stirring frequently until carrots are lightly coated with glaze. Remove carrot mixture to platter, makes 10 accompaniment servings.